When civilization has been destroyed! When the world has been reduced to a low budget friendly desert! When only a handful of people survive! When the rule of law is replaced by the savage rule of the wasteland! One man will stand above all others and command them with his bizarre vision of a new society where he screws all the fertile women and forced suicides are the order of the day to maintain a sustainable population! Such a tyrant can only be called…Kragg! And he could only be played by…Bull…from Night Court! But as long as there have been tall, goofy-looking warlords who would rule their barren world for their own sinister purposes, there have also been good-looking, silent heroes to free the wimpy human leftovers! Men who would dare any danger, take any risk, and screw any hot looking broad they come across on their journey toward their destiny with destruction! That they are the toughest of the old world, being able to take a few bullets, a healthy beat down, and a good stabbing in their wanderings only serves to remind us all that we have lost and all that we have yet to hope for! And lo, through the burning desert shall come such a man to do battle with Bull from Night Court! A man known only as the Survivor! A man who could only be played by…Vance Duke…from The Dukes Of Hazzard! I have seen many an apocalyptic movie in my time, but one where a supporting cast member from a mid 1980s sitcom fights a scab Duke boy for supremacy over the remains of our once great way of life? Truly, the Gods have cursed us for our hubris! Cursed us with undeserved post-apocalyptic goodness that is! 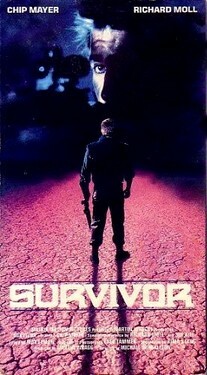 Survivor turns out to be the most effective end-of-the-world thriller starring Bull and Vance you could imagine! Perhaps since he’s the strong, silent type, he is keeping his pain to himself. If there was only some way we could be privy to his thoughts, maybe then we would know the depth of his soul searing anguish! But we do know his thoughts! Vance communicates to us through an internal monologue we can hear! I’m guessing that the radioactive desert fried a few synapses because I couldn’t figure what the hell he was talking about half the time. He’d be babbling about some old man who told him about a paradise and then he’d have these visions of Bull. The interesting part was that once he and Bull finally met up, Vance’s thoughts became even more confusing with a lot of mental flatulence about destiny! Bull wasn’t any better. While he was more of a talker than a thinker, his speeches to Vance made Vance’s stony silence seem like the height of intelligence. When Bull spoke about evolution, it was a testament to Vance’s toughness that he didn’t burst out laughing when Bull mentioned the duck-billed platypus. No warlord leader should ever mention a duck-billed platypus in his “here’s my evil scheme to rule the world” speech. Bull was on a roll though and things only went down hill from there as he started pontificating about a new man called Homo Realitus. I imagine that Vance probably thought things really went downhill when Bull gave the order to castrate him! All that jibber jabber and unfortunate threat to whack Vance’s little Dukes off didn’t take place until the last third of the movie. The first hour was actually a pretty effective effort at depicting one man’s odyssey through the nothingness that Earth had become. Thankfully the movie eschews a lot of those dopey mutant-ridden wasteland cliches Mad Max inflicted on us via its countless imitators. There aren’t really any biker monster types with mohawks, spiked shoulder pads or souped-up dune buggies with dudes in eyeliner firing crossbows at people trying find water. Survivor takes the view that in a world where almost everyone has been killed, there just aren’t that many people left! Vance runs into a few people who try to kill him and manages to rescue a woman who becomes his girlfriend, but other than that he’s either riding on his solar powered rail car (not as cheesy as it really sounds and besides he wrecks it pretty spectacularly) or walking around the desert. This world really feels empty. 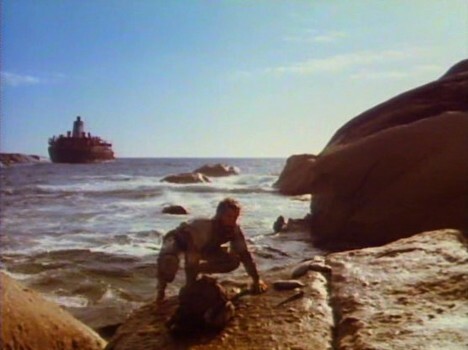 It’s also a surprisingly good looking movie with lots of shots designed to show how vast the desert is and the scenes of the rusted out boat Vance and his old lady live on are equally impressive. Once Vance finds the underground power plant Bull is running (Vance is looking for his kidnapped girlfriend) you get a nice healthy dose of the brutal action you demand from your end-of-the-world flicks. Again, Survivor keeps it real by not having Vance being forced into some futuristic game of death. He’s been asked to kill Bull by some of the other folks at the power plant and those loyal to Bull try to take him out. There’s lots of guys swinging on chains high up in the power plant with Vance having to fend them off. The showdown that finally occurs between Vance and Bull is just as nasty and I won’t pretend that I didn’t wince when Vance started swinging an axe at Bull! I also won’t pretend that I understood some of the finer points of the whole “Vance is destined to fight Bull to decide the fate of the world” visions. 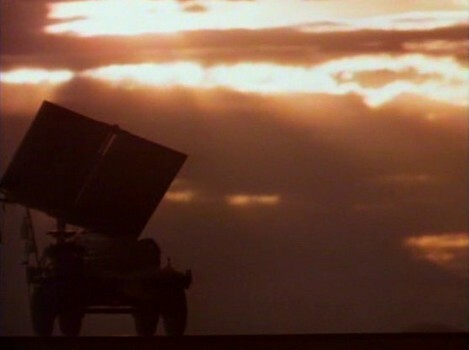 The movie also makes an Armageddon-sized misstep with the Love Theme From Survivor that plays during a love scene and at the end of the film, but on the whole, it was far and away better than we had any right to expect something starring Bull and Vance Duke to be.